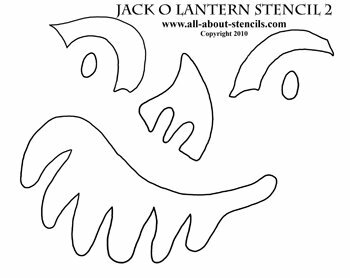 Scroll down for Free Jack O Lantern Stencils to carve a pumpkin or for any Halloween Craft you can dream up. Thinking about Halloween Crafts and projects? Well, it’s about that time. You know...for all the little ghost and goblins to come out! 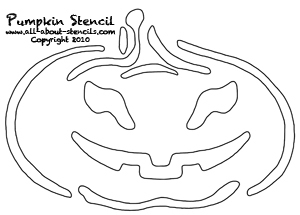 This page is all about Jack O Lantern Stencils. So, let’s get this party started. There's more to Halloween than just carving the Jack O Lantern. Don't miss the video at the bottom of this page for more fun projects and ideas! Pumpkin Carving... It’s the one Halloween Craft that gets the whole family involved. When the weather turns cool and the sweaters come out, it’s time to head to the pumpkin patch or farmer’s market and start the search for the perfect pumpkin. And once you’ve found that one, you need to have the perfect face to carve into it. 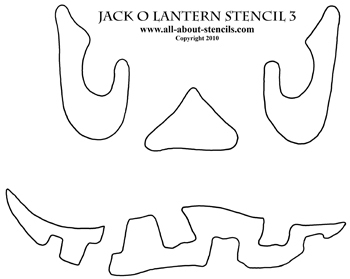 Here are three Jack O Lantern Stencils for you to choose from. Just print from your computer and carve! If you’re looking for the how to of pumpkin carving, you’ve found it! Best of all these instructions step you through the process of using jack o lantern stencils so that you can be much more creative with your pumpkin’s design. You’ll be the envy of the neighborhood. Want more free pumpkin carving stencils? We have a few creative designs for you that will make pumpkin carving easy. 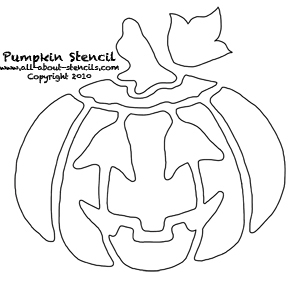 Just print the stencil out and start creating your pumpkin masterpiece. Look for the Scary Cat in the Moonlight, The Ghost in the Doorway and The Gonna Getcha Monster. Did you know that cut-and-paint stencils are less expensive (unless of course they’re free like these! ), because you’re not paying for the manufacture, warehousing and shipping of a product. If you can find downloadable stencil designs you can have your stencil immediately and no delay to your project. Here we offer some free stencils to get you started and a few in book format of our more complex designs. Do you want to see our catalog? Hop over to our Stencils Page. For a quick variety pack of scary stencils head over to Printable Halloween Stencils. These are great for all your Halloween Crafts. It’s time to get ready for all the little ghosts and goblins. With Cookie Stencils you can decorate some special treats and get your Halloween crafts off to a great start. Like I always say, stencils make putting pictures in difficult places much easier. I have the recipe and stencils prepared for you! Done with the pumpkin carving yet? No! Can’t stand the mess? Here’s a Pumpkin Crafts idea for you. Use a plastic craft pumpkin to carve your jack o lantern stencils this year. No Mess! No Fuss! And boy did it come out cute. Best of all you only have to do this once because you can pack it away after the holiday and bring it out again next year. If you’re a fan of recycling and keeping things simple then this project is for you. 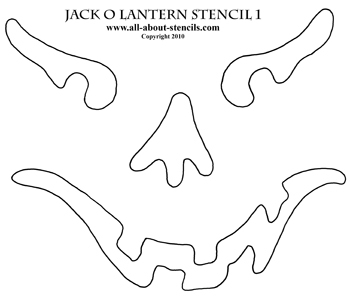 Maybe I misunderstood and you aren’t looking for jack o lantern stencils to use for your pumpkin but wanted stencils to decorate a Trick or Treat Bag or maybe decorations for the windows. Well here are two options for you. Again, just print, trim and paint. Working with paper stencils has a few more advantages. You can adjust the size of your paper stencil to fit the size of your project. Just take the page to a copier and reduce or enlarge. Then cut out the stencil openings. It's that easy and you can’t do that with a plastic stencil. Wait! There's more. Don't miss these cute Free Pumpkin Stencils and the ideas that I share with you for using them (along with a great video). And if it's felines that you're into than don't miss the Cat Stencils for Pumpkin Carving and other Halloween Crafts. Hey! Don’t forget that I (and everyone else) want to see what you have done with your jack o lantern stencils. Just click on Stenciling Projects to get your masterpiece showcased here on this web site. Won’t that be exciting! Or if you have any questions or want to share information join in on the Stencil Blog. Well, I hope to hear from you soon. P.S. We are thrilled to introduce our selection of Downloadable Stencil Designs. Instant gratification at its finest! You don't need a special printer - these designs are specially formatted to print straight from your home computer on standard letter sized paper. Once downloaded, you will have your complete stencil booklet with patterns and instructions. Just click, buy and print! OK! Not scared enough? Well, here's a Halloween Craft Idea video so don't be frightened into thinking it's the end. Enjoy! 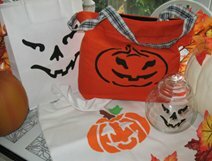 Return to Home Page from Jack O Lantern Stencils. Return to Halloween Crafts from Jack O Lantern Stencils.